Jacqueline Gareau is one of the most decorated Canadian distance runners of all-time. Her win at the 1980 Boston Marathon was Canada’s best place finish since Jerome Drayton cut the tape in 1977. Meanwhile, Gareau, 66, stays running and active in the community, giving talks, massage and working with athletes on their form. As a special event in partnership with Divas Running Series and BlackToe Running, Gareau will be in conversation with Krista DuChene in Toronto on April 4 and offer clinics on April 5 at the Running Physio, a once in a lifetime dream coach to help you reach your goals. Ben Kaplan spoke with Gareau in advance of the event. iRun: What do you think of the women’s marathon record being broken by Rachel Cliff? Gareau: Nice! That’s what we want. 2:26:56, it’s a start to being more competitive with the rest of the world. If we have more 2:26, 2:25, we have good contenders for big competitions, Boston or the Olympics, the World Championships. It’s very exciting and that’s bringing more girls to the sport. It’s a celebration, I say: Go, Rachel Cliff! iRun: Are you surprised the marathon record keeps being broken, by Lanni, by Krista, now Rachel Cliff? Gareau: We’re capable, with good training, good balance, especially because injuries slow you down, that was my case. I could have improved, but you get injured, and then you hurry to recover while still injured—there’s women today, they have good posture, good stride, it’s a learning process. We improve. iRun: What helps a runner improve? Gareau: It’s a melting pot. Rest, training, diet, discipline, support. I mean, medical is important. This isn’t about me, it’s about the great new runners, Krista, Lanni Marchant, but I see all the things I neglected. You need good coaching, and to respect the training schedule. Don’t get too high, or too low. We get excited: I think I can do more! That can be an error. I’ve seen good runners run one good time then that’s it. iRun: What do you mean? Gareau: You don’t have to be a world-record holder or Olympian to go over the line. It’s easy to get injured, to over-train. I missed the Olympics because of that, no rest. That’s a mistake. iRun: What from your career was not a mistake, what did you get right? What did you learn? Gareau: In 1978, I was second in Ottawa. In 1979, I was first. I improved very quickly because I paid attention to my form, improved my stride, my positioning. You have to run with gravity, with symmetry, and I like a quick stride—a long stride isn’t efficient, that stuff is important to run at your best. 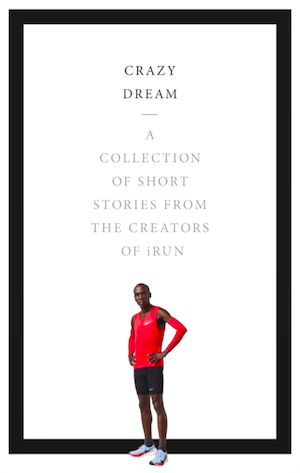 iRun: Boston, of course, is coming up. Do you miss it? Gareau: Next year I might go, not to run because I’m having treatment on my knees in April, although, who knows? I cross-country ski and bike and swim, I like to run in the water, too. I think I’m still in pretty good shape. But I don’t miss the competition, no. iRun: Do you have a current goal? Gareau: I want to be 75 and be running. I’m 66 and so far, so good: I feel great. iRun: Did you get nervous before you raced? Gareau: The day before you get nervous, but you need that. I remember in Los Angeles, that was when I felt best, physically and psychologically. Six months before the Olympics and I prepared in hilly Florida, I did my visualization and in the morning I felt like dancing, powerful and light. Also the second time in Montreal when I won, it was 1987 to qualify for the 1988 Olympics, oh, I had injuries and surgeries, I was not at my best, and a girl was running after me, but I was prepared mentally: I visualized with Chariots of Fire and accelerated and I won! If you prepare well and train, for anybody, it’s easy to control the nervousness. iRun: Rosie Ruiz, Rosie Ruiz, the cheater Rosie Ruiz. Can you tell us the story of your most famous race? Gareau: I’d run New York previously and was third, but I wasn’t running Boston to win, I just ran every race to PB. Jock Semple, he’s the guy who pushed Kathrine Switzer, he saw me at the start and pushed me to the back. I went all the way to the back and had to run the first five miles fast to catch the runners, which, OK, not a great thing to do. Kathrine Switzer, she was in the press truck, and I held on and was supposedly the first woman until someone shouted at the last two K: “You’re the second woman.” I thought, OK. Kathrine had been showing me running first, but I don’t know, so I didn’t break the ribbon and walked off by myself. Gareau: It was really OK. I know that I ran well, but then I saw this girl with Bill Rodgers, the male winner, and I asked what time did she finish. It was like 2:31-something, a world record. I thought, wow. No wonder I didn’t see her. I accepted it, but Bill was looking at her—she wasn’t sweaty, no nothing. Soon they discovered she didn’t run, and she didn’t run New York either, to qualify. She took the subway! iRun: That doesn’t seem fair. Gareau: Well, in Boston there was no subway, instead she jumped in at the last 3K, a student saw her. She was putting water on her head and looking dizzy to act tired, something like that was the story. It seems strange even to this day. iRun: She kind of robbed you of your moment. Gareau: I’m in a better position than she is. I wouldn’t like to be a cheater. And I’m happy with the course record and when I came back, I knew I won. I just wish for her, you know, she’s probably sick mentally. It’s a really strange story, but it doesn’t have much to do with what our sport is really about. iRun: Take us into your life today. Gareau: I’m a massage therapist and give lectures when I’m asked. I’m 66 and think I have enough wisdom accrued to talk about a well-balanced life, what I’ve learned and how we can run at our best. It’s balance that’s the most important thing. iRun: What are you going to do in Toronto? Gareau: Of course I look forward to meeting Krista, she ran really well and must be very strong. So there’s that, then the next day if we can go outside I can look at everyone’s stride. I want to explain ‘running with gravity,’ how to attain symmetry. The pelvic position is very important. You don’t want to over stride, nor hit the ground very hard. I want to touch on stride frequency. These things, they help make a good runner great. 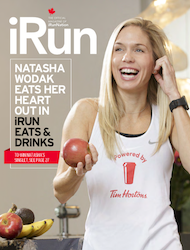 iRun: You mentioned Krista DuChene. What’s that you like about our third-place finisher from last year? Gareau: She’s great. She’s not so young. She’s a tough girl. That weather last year, that wasn’t so nice, but we Canadians are tough. Silvia Ruegger is tough. Two times Silvia accelerated past me to get the win. iRun: We have good news for you. We told Silvia you were coming to town and she said she’d come to your event on April 4. Gareau: Silvia helped teach me how to get better. Definitely some of what I have learned, I learned racing her. That will be nice. iRun: Do you still got it? Gareau: I did a local race recently, 10K. And this young girl, she stayed with me. Well, she almost did. Then I did an acceleration to win. iRun: So you do still have it. Gareau: I love to run. It makes me feel light and free.